Bumbleroot Organic Farm is a small MOFGA certified organic farm currently located in Buxton, Maine. The two couples behind the farm, Melissa + Ben and Jeff + Abby, grow vegetables, flowers, and herbs, and sell their produce at the Portland Farmers’ Market, the Saco Farmers’ Market, the Kittery Community Market, and through a CSA. This past May, the four farmers purchased a former dairy farm in Windham through MFT’s Buy/Protect/Sell program. The easement placed on the property made the land more affordable for the oncoming farmers, and ensures that the land will be forever available for farming. The farmers plan to move to their new land this fall. The two couples met while farming in Colorado but wanted to move East to be close to their families. They chose Maine because of its vibrant food and farming culture, and for the strong support network for beginning farmers in this state. 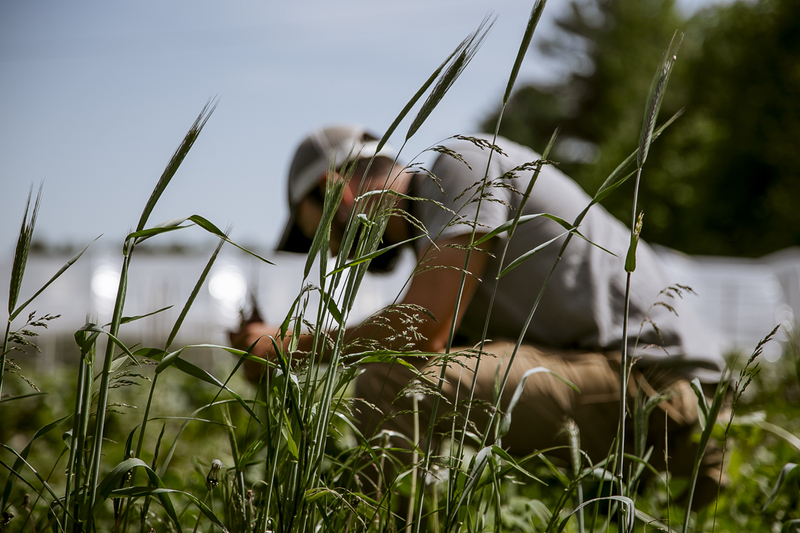 They began looking for land in Maine in 2013, and knew they wanted to be close to the Portland markets, and to Allagash Brewing, where Abby has a off-farm career. They kept an eye on Maine Farmlink, and through that program, found the land in Buxton that they currently lease. There, they’ve grown a thriving operation, thanks in no small part to generous neighbors that have been willing to let them lease additional land. But still the farmers continued to look for a larger and more permanent farm property, where they could grow their business and cultivate a more diverse, holistic farm. Join us for a Forever Farm Party at Bumbleroot’s new farm on July 14! Good food, local brews, and live music. All are welcome! Full details on our Events page.